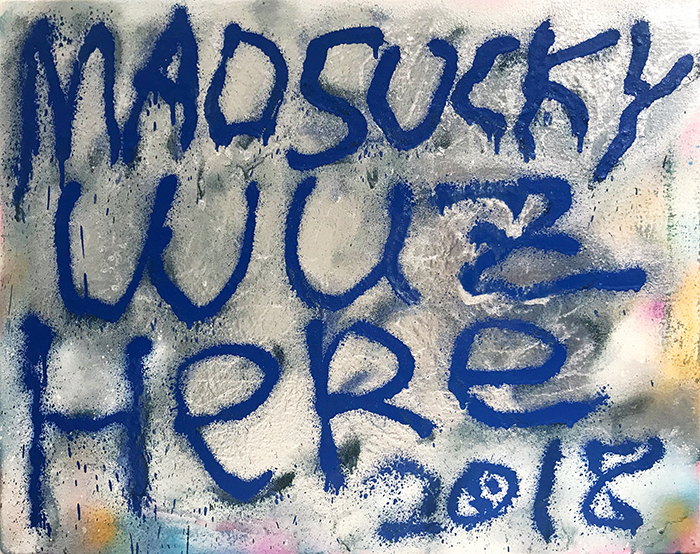 Kaikai Kiki Gallery is pleased to announce that from October 5th, 2018, we will be presenting MADSUCKY WUZ HERE 2018, MADSAKI’s much anticipated second solo exhibition at our gallery. Following his fated meeting with Takashi Murakami over Instagram in 2015 and subsequent string of solo shows across Tokyo, Seoul, Bangkok, and Paris, Osaka-born New Jersey-raised MADSAKI has become unmistakably recognizable through his signature spray paint-splattered compositions and his vulgar, satirical take on mass cultural memes. Although now almost synonymous with spray cans and swear words, MADSAKI originally painted exclusively with rollers and brushes; he had no background in street graffiti, and only began to use spray cans after returning to Japan. The original inception of his spray-can painting techniques began several years ago with his Beyond Words series— canvases with (often obscene) English slang scrawled haphazardly in spray paint, replete with curse words and jokes reminiscent of the kind of American high school banter that hovers between chummy teasing and malicious taunting. What seems at first glance to be crude and thoughtless appropriation, however, in fact stems from his dysphoria of being rejected by the two cultures that raised him, and his continued struggle to find middle ground between Japan and America. After moving to America as a child and experiencing discrimination because of his Japanese ancestry, his return to Japan paradoxically left him feeling equally as alienated, this time because of his Americanized childhood. With no one to speak English to and trapped within himself by the confines of language, he began to speak to, laugh with, and curse at himself, using the medium of spray paint as a way to seek further comfort in the nostalgic graffiti aesthetics of his American upbringing. When reconsidered as imaginary snippets of the conversations that he could no longer have, the text paintings underlie a vulnerable shade of loneliness and homesickness. This deep-rooted inner conflict permeates all of MADSAKI’s works, and the use of humor and borderline offensive phrases function as a rebellion against the barriers of language and culture that trap him. This time, MADSAKI delves past the therapeutic distraction of his hypothetical conversations in an attempt to come face to face with his real emotions. Much of MADSAKI’s work in the past has served as some sort of escapism: in his Wannabe series, an homage to the old masters who have inspired him, he sought to escape the distress of everyday life by seeking connection with great artists from the past, and his portrait series of his wife revolves around his adoration for the woman who he has likened as his savior. However, in this exhibition, the artist forces himself to confront his frustrations candidly—but, of course, not without his trademark crass wit. MADSAKI reconsiders his identity and modes of expression as an American-raised Japanese and reflects on his struggle to communicate with an increasingly connected world, using puns and one-liners that shock us, entertain us, and ultimately make us laugh. To rebelliously make jokes even in the face of self-doubt and frustration is MADSAKI’s philosophy, and through this show, we hope to shed light on the artist’s evolution and ability to find the humor in all aspects of life. The text series started off with me scrawling slang phrases onto canvas as if to curse at myself. Then, the act of drawing my feelings onto canvas became the subjects of new pieces themselves, and by the time I realized it, it had become a staple category of my artwork. This time, though, I wanted to quit running away by doing what I always do, and purposefully pushed myself. I sealed away my vulgar jokes and meaningless phrases and dug even deeper into my feelings during creation in an attempt to convey a vision of the world through the lens of my currently evolving self. And that was fine and all, but since I was doing something unfamiliar, I immediately ran into walls and got stuck in mud, and I couldn’t get out, and I was like F*****CK!!! But I told myself that I was going to find the humor and enjoyment even within this almost ascetic process, and somehow overcome this adversity. My hope is that I am able to convey this attitude of mine through my works this time.